Does the price of oil display a seasonality pattern? Let’s see if this is still the case. The following chart plots the average month returns of the price of WTI (West Texas Intermediate) for the period 2000-2016. A two-part pattern for the year is still observable, but the periods have shifted slightly. As can be seen, since 2000, WTI month returns have tended to be high in the period February to June. 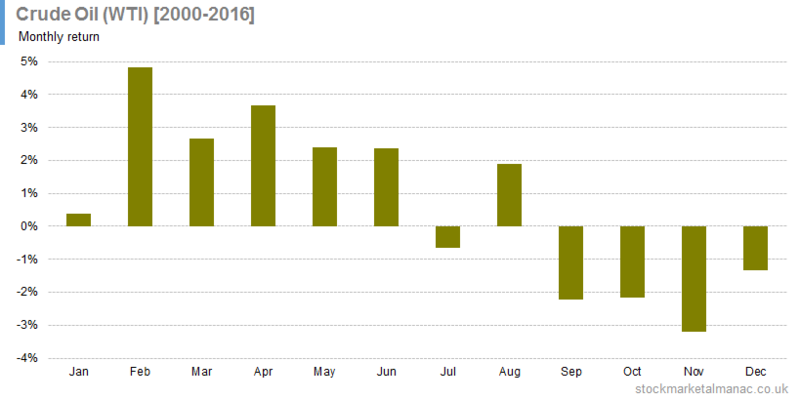 The strongest month of the year in this period has been February with an average return in the month of 4.8%. The weak part of the year has also shifted: to September to January. 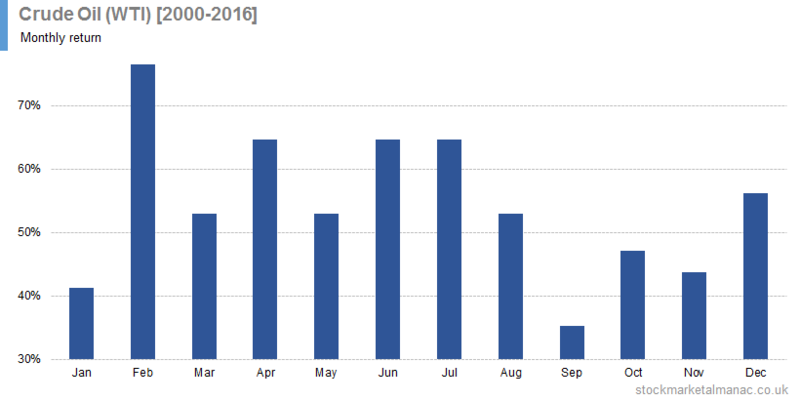 The weakest month has been November, with an average price return of 3.2%. 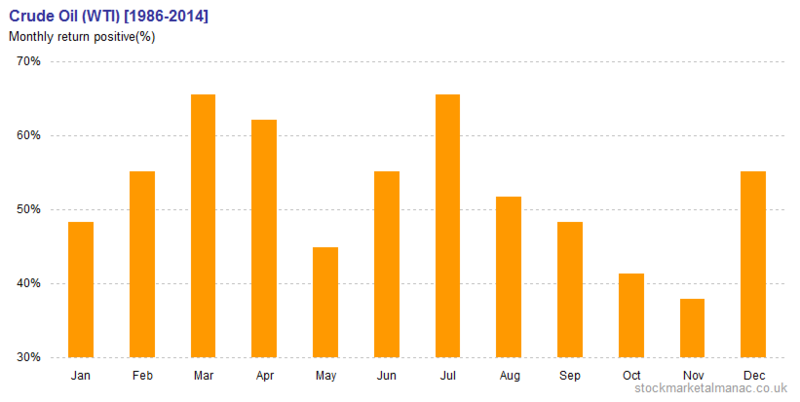 The following chart plots the proportion of monthly returns that were positive over the same period. This pattern of positive returns largely supports the preceding analysis. Since 2002 WTI has seen negative returns in February in only 3 years. By contrast, September has seen positive returns in only 6 years since 2000. For benchmarking purposes WTI (continuous holding) and the S&P 500 Index are also plotted. All series are re-based to start at 100. Starting at 100 in 2000, the WTI (Weak Months) portfolio would have fallen to a value of 16 by 2016. The S&P 500 would have a value of 145, and a continuous holding in WTI a value of 182. But the WTI (Strong Months) portfolio would today have a value of 1047. 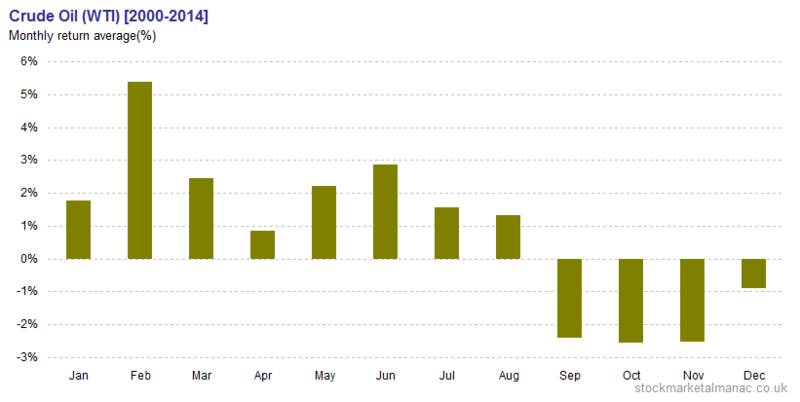 This article looks at the monthly seasonality in the price of crude oil (West Texas Intermediate, WTI). The following chart shows the average price change by month of WTI for the period 1986-2014. For example, since 1986 the price of WTI has increased on average 0.5% in January. From the chart it can be seen that, historically, March, April and August have been strong months for WTI, while October and November have been weak. 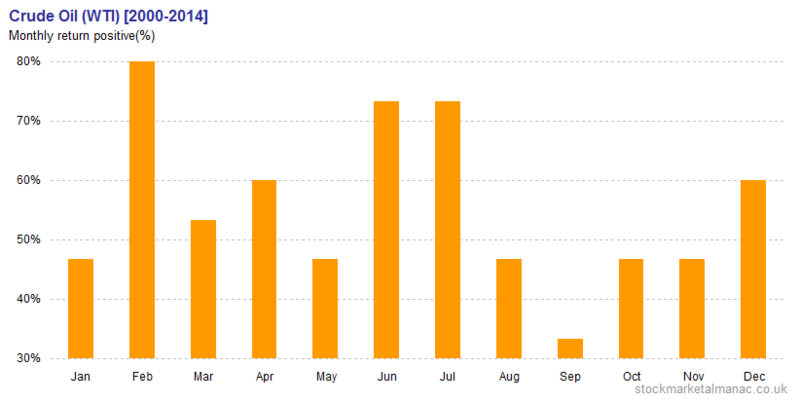 The following chart plots the proportion of monthly returns that were positive over the same period. For example, since 1986 48% of the WTI price changes in January were positive. 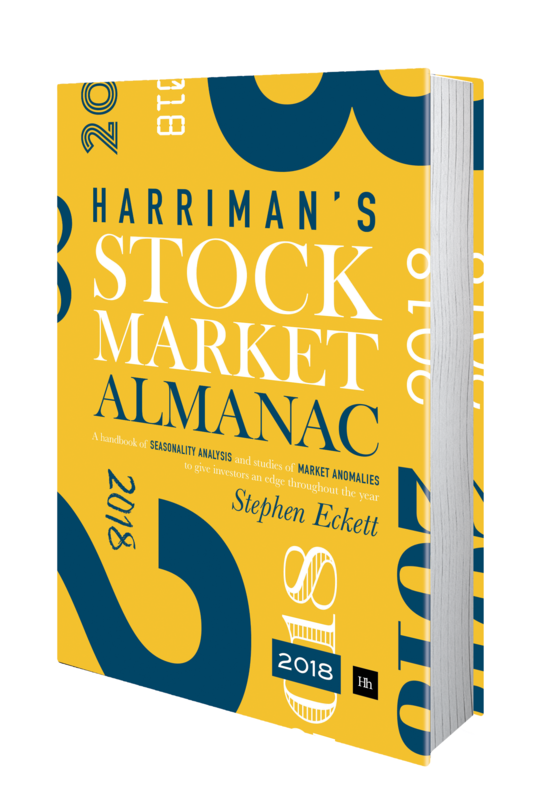 The pattern here largely repeats that seen for the average returns: the strong months are March, April (with July also being strong), and the weak months are October and November. 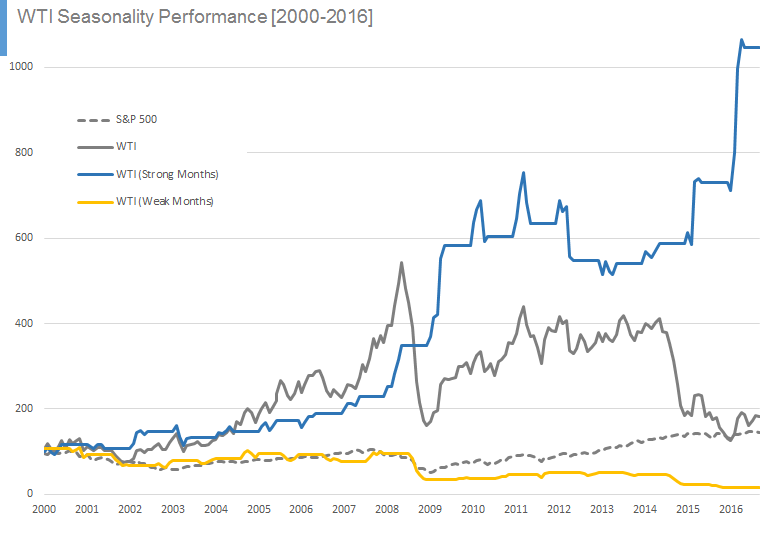 To assess the persistency of the behaviour, the following chart plots the average price change by month of WTI for the period 2000-2014 (i.e. this is similar to the first chart above, but the starting point is 2000 instead of 1986). . Roughly, the two-part nature of the year can still be seen in the monthly performance: the WTI price is relatively strong March-August, but the now weak part of the year starts in September, through to December. The big change in recent years can be seen in the strength of the WTI price in February: since year 2000 WTI has an average price change of +5.4%. For completeness, the following chart plots the proportion of monthly returns that were positive over the same period.